If your a regular here, you know that we are smitten with games, nerd culture and the DIY mentality. Which is why Kickstarter tends to get a lot of love from us, both on the site as well as our bank accounts. 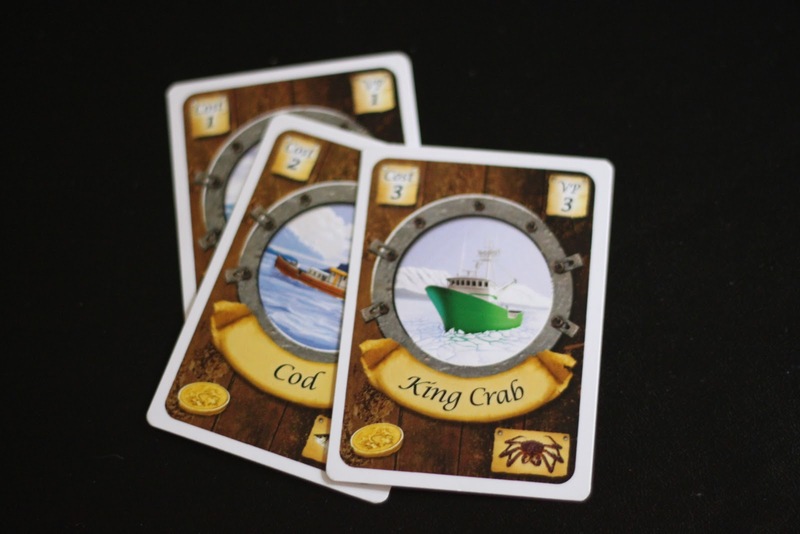 Recently Fleet, a new board game project much akin to a euro card game in play and style, hit the scene and hit its funding goal of $6,000 in less than 12 hours. We reached out to Matt Riddle and Ben Pinchback and had an opportunity to talk with them about their current project, thoughts on Kickstarter as a platform, games and what the future holds. Read our interview with them after the jump. to your Kickstarter page and read up on it, but there is very little information there about the two of you. What can you tell me about you? Ben: I’m married and have a two and a half year old son who now also designs games every Tuesday night when Matt comes over. It was just the other day Ty was talking to Matt and I about buiding size exponential vs linear scoring in our area control design. Pretty intuitive for a two year old I’d have to say. Seriously, I enjoy hanging with the family, gaming, mountain biking, gaming, and golfing. I always knew I had it in me to design a game, but getting someone else to play it was always the biggest hurdle for me. We owe a ton of thanks to Gryphon Games for all of this. stuff to deal with. He finally had to step down. has. Go checkout ericjcarter.com and hire this guy. Eric was sending sketched and card updates and layout changes on Christmas Eve and Christmas, then worked all week in between to get this art done so we could get protos printed. It was crazy. I remember sitting at my in laws house on Christmas day sneaking looks at my phone and checking out one of Eric’s boat drawings he had just sent and, of course, it ruled. figure everything out before hand, so there’s a TON of “It seems to me..” followed by dozens of rounds of testing. The cool thing was that we had fun every single time we ever played Fleet. That’s how we knew we were on to something. It always remained fun. 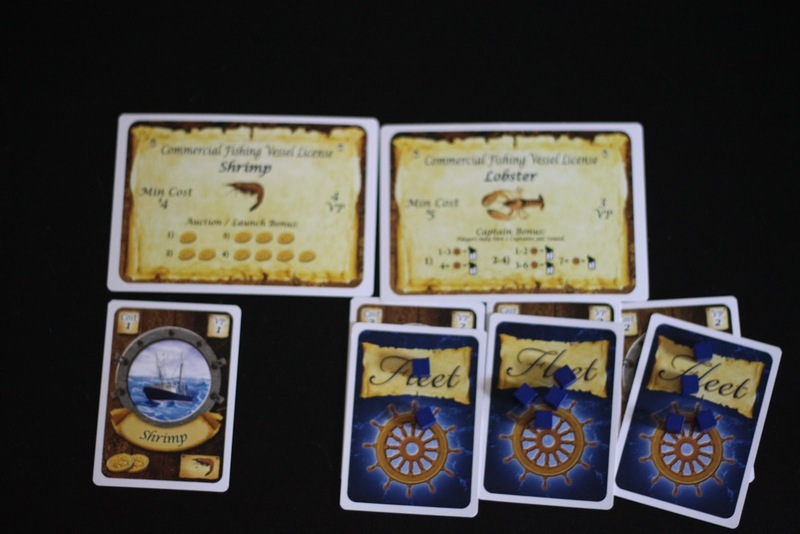 Gryphon Games will be publishing Fleet. What led you to publish with them, as opposed to doing it yourself? This is the age of Kickstarter after all. Matt: 50% lazy, 50% busy. Ben and I both have really good 9-5ish jobs and young kids. I am very impressed by the guys that can balance that AND self publish a game. It has been a ton of work getting Fleet and a kickstarter off the ground with Gryphon’s help, and that is with them handling all the production, logistics, and such. Ben and I were given responsibility over the kickstarter and any “grass roots” promotion. 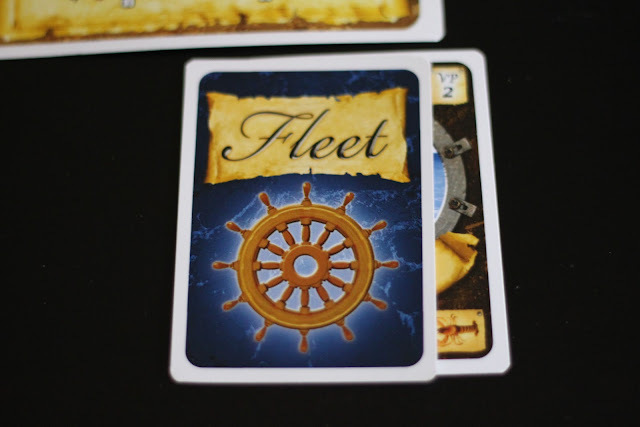 There are so many great websites out there talking about games (like fruitlesspursuits.com ) and we have had the opportunity to discuss Fleet with so many awesome people. Ben: Matt and I never intended to get rich designing games. My #1 goal has always been to get my designs into gamers’ hands and hope they enjoy them. When Gryphon responded positively to us regarding Fleet, it was a no brainer for me. I already had half a dozen Eagle/Gryphon games myself and knew this was a golden ticket opportunity to get into the industry and get our games out there to the masses. Sure maybe we’ll look at something in the future, but the chance to work with such an established and professional gaming company was the perfect intro to the industry for me. 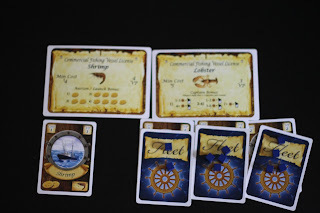 What can you tell me about designing Fleet, and how it came to be? Who did you have in mind for playing this as you were creating it? 2ish years later and HUNDREDS of hours of playtesting later and Fleet is born! Ben: That about sums it up. At first it was fun to just start the project, but once we got rolling and realized we might actually be on to something, the ideas just kept coming. The target audience has always been that player who loves a good card game but wants one with substantial meat in a reasonable amount of time. Filler time but not filler weight is what we’ve always said. You are two dudes from Detroit. 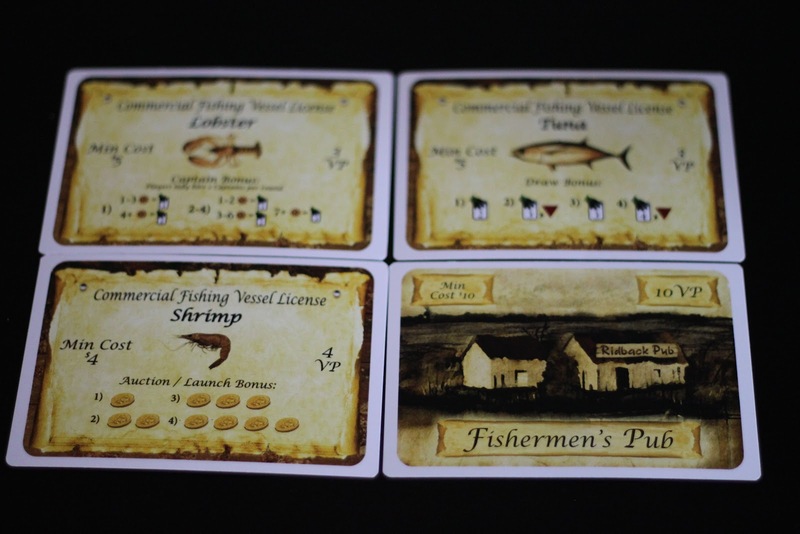 Obviously we all know that commercial fishing is a pretty big thing there, but how did that translate into a theme for your game? Matt: We are mechanics first, theme second. 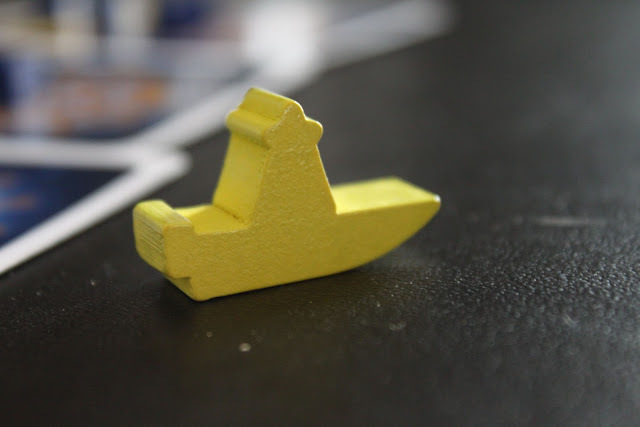 Theme is very important, but we had a good chunk of the design done when our buddy Pat suggested cool boats and fishing. 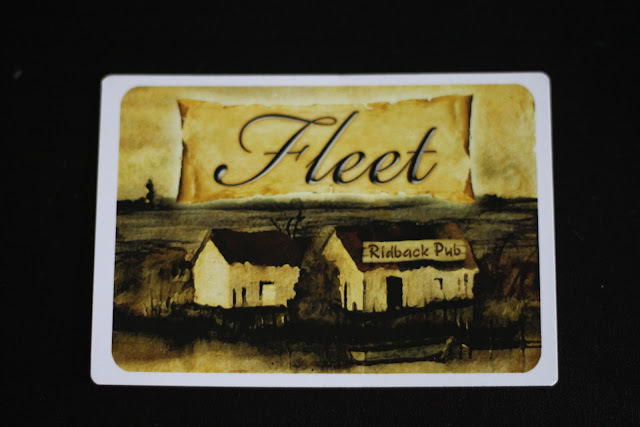 Ben does a good job of talking about how that helped Fleet grow. probably our two best mechanics and they both came straight out of the theme. It was a cool process. The game would have been much worse without Pat’s initial suggestion. We’d still be buying parcels of land and settling cities. Being your first time publishing a game, I'd imagine there’s been a decent learning curve during this whole process. 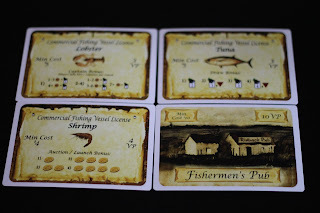 What are some takeaways you'd be willing to share that will influence your next game? Matt: Do it for the love, because there is not any money. It is also a TON of work and completely worth it. Ben: My advice is the same these days. Don’t be terrified of publishers. They are busy hard working people just like you and me. Have a good game well presented with good rules and go market yourself. You can do it. Matt and I have easily 15-20 “no thanks” emails that we appreciated even hearing back on, but we believed we had a good game and kept going. think our game has staying power, but of course I’m biased. Anything that you'd suggest to improve the Kickstarter experience for all? Matt: Be discerning. It is fun to back projects and watch them develop and fund, but do not back games that are not complete. I still see too many projects that seem like they are only 50-70% done and maybe the designers became overcome with excitement and were premature in launching the campaign. Make sure the game is done before you back. Ben: I think it’s a win win win for everyone. Publishers, designers, and consumers. If consumers pick wisely, like Matt said, then they are probably going to pledge some great games that also end up kicking in some really cool swag along the way. This is a fantastic bang for your gaming buck. Any current Kickstarter projects aside from your own that you've been eyeing? 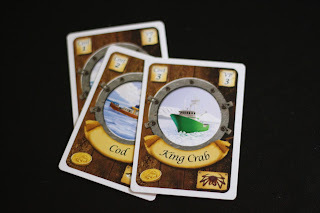 Matt: I backed several past projects (Zong Shi, Carnival, Borogrove). Currently, Gunship: First Strike is #1 KD project. Steve and Sam (two of the principals involved) were incredibly helpful to us when we were launching Fleet. Currently I have backed and am tracking Gunship, Cartoona, and Farmageddon (which just closed). I missed out on Viva Java, which I think looks really neat. There are a few others I want to look into when I have a little time as well. Oh, and Double Fine (me and 1 million of my closest friends). Another cool thing about kickstarter is that if a game is successful, but you did not or chose not to back it, it will be available when it completes production. 90% of the time Ben and I play games, the other is also playing so we very rarely double up on game purchases, so he has not backed any of these projects, but we discuss them all the time. Ben: Being a former niche indie music junkie, Matt is waaaay ahead of the curve compared to me on all the latest gaming hotness. By the time I catch wind of a really good polished campaign, Matt has already funded it. Like most other people on the Geek, I’m excited about and waiting for Atom Punk. 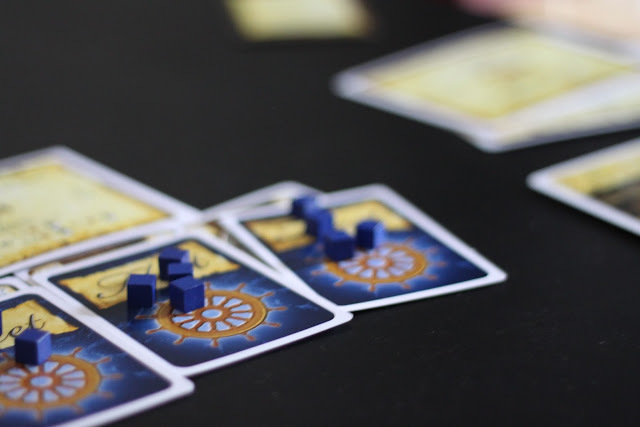 Favorite games of all time are anything designed by Knizia, Power Grid, Dominion, and whatever Matt and I are currently working on. Matt: We are on game #3. Game #2 is a pick up and deliver, more of a classic euro then Fleet. It is out being blind playtested as Ben and I work on game #3. When it gets back we have to decide where to go with it. Leave it as is or take it a few steps deeper. It's a fun tight game right now, we have some ideas to make it deeper but like its current incarnation as a mid weight "gateway game". We would like to have it I'm front of publishers by summer. Ben: As Matt mentioned, game #2 is undergoing blind testing and has a day of reckoning coming soon. Do we add depth or keep it short, tight, and medium to lightweight? It's hard to decide when we prefer a deeper game, but we also know there is a large market for streamlined family titles. My guess is we'll add a layer or two. Game #3 is our take on area control, and we think we have a few legitimate innovations here. We couldn't be more excited for this one. Other than that it's our catalog of future Fleet ideas both tested and untested. I guess we'll see if the market has a want for them. I sure hope so! It's been a fantastic journey so far sharing our game. Anytime! It was great to work with you guys, and look forward to doing it again soon!